You are so rude Ruby I bet you, you need a nose job!!!! Bindi you are sooo pretty you are the dam age as me and I really wan to be in your show BINDI's Bootcamp!!!!! These two were so ugly. Their kids gonna need nose jobs and other major plastic surgery for sure! It surprises me much to think how a GOD of a personality could die, ever!!! You were, are and will always be the greatest to me and all your fans man!!! tell me something, are there crocs up there too?? If not then you must be missing the ones you left behind!! Do one thing, PLEASE COME BACK!!!!!!! I just finished the "steve and me" book the other day. steve was a role model to me and my two younger brothers. he was an amazing person and there are many people who wish that he was still here. I feel Terri's grief and I pray for you every day. 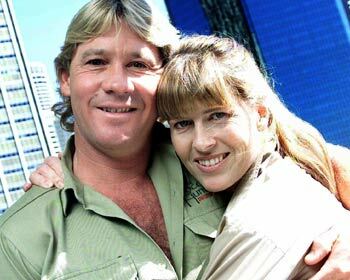 they were two beautiful people who loved each other and their work, i miss steve, wish he was still here with us! First of all I'm sorry for your loss. Your husband was a great man, good husband, good father, and my hero. This picture should always remind you of his love for you. Now that he's gone, I guess you have no one, well you know what? You have Wes who has helped your family out for years and he's there for you. Just remember that Steve loved you very much and still does. God Bless. so in love!!! no one can ever take your memories away!!! This is a most beautiful picture. You can obviously see they were perfect for each other. I've never seen this picture before, its wonderful. They were truly soulmates. Thanks for posting! It's been almost a year since the death of our beloved 'Croc Hunter', but he'll always be in our hearts and minds. I'm sure he's looking down from heaven and is so proud of his family for carrying on his legacy! You're one special family and loved by all!